New Palau Blaugrana is a multi-purpose pavilion being constructed by FC Barcelona. Image courtesy of HOK and TAC. HOK and TAC Arquitectes have designed the arena, which will be located built on the site currently occupied by Mini Estadi. Image courtesy of HOK and TAC. The arena is designed to accommodate 12,000 spectators during sporting events and 12,500 during cultural events. Image courtesy of HOK and TAC. 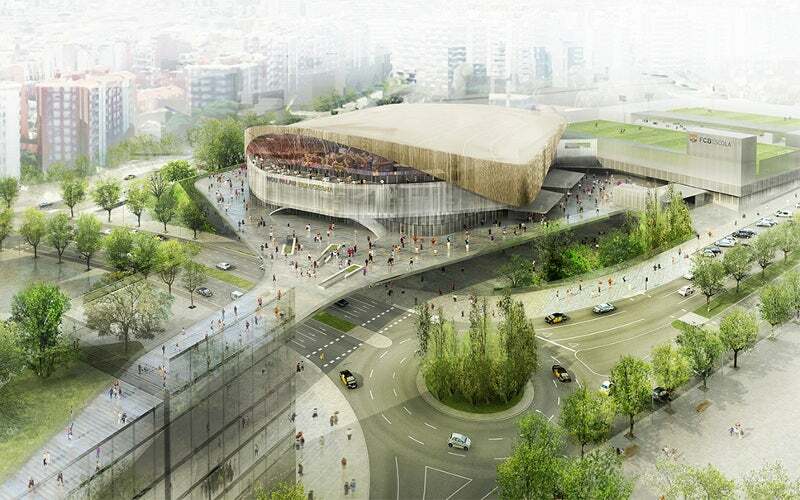 The arena is expected to be completed in time to host the 2019-2020 basketball season of FC Barcelona. Image courtesy of HOK and TAC. The seating bowl has been designed to exhibit an asymmetrical design to increase its capacity. Image courtesy of HOK and TAC. The arena is being constructed by FC Barcelona as part of its Espai Barça project and has been designed by HOK and TAC Arquitectes. An international design competition was held to select a winning proposal for the €90m ($101m) project. The proposed project aims to create a large urban development that will also include the club’s new stadium, Nou Camp Nou, and will connect with its training academy, the FCB Escola. The arena will host games of basketball, handball, roller hockey, and futsal. Construction on the project is expected to start during FC Barcelona’s 2017-2018 basketball season and be completed during the 2019-2020 season. The arena has been designed to be an open and inviting sports and entertainment hub. The entrance to the auxiliary court, ice rink and the FCB Escola located in the indoor boulevard will be shaped like a rectangular prism. The arena is designed as a curvilinear structure with a metallic facade, which will provide a view of its interior. The seating bowl features an asymmetrical design similar to a theatre setting. The design creates additional seating space and is the first of its kind for a basketball arena. Technology was used to adjust the venue’s geometrics and build a tighter, steeper and more intimate bowl. The arena will have a seating capacity of 12,000 for sporting events and 12,500 for social and cultural events. The flexible design of the building allows it to host different events and also meet the Euroleague basketball requirements. A large projection screen will be placed under the building’s roof. The outdoor area will include public facilities that will be accessible throughout the year, promoting an open-air, street festival environment. Vehicle-free patios and public plazas will offer meeting places before, during and after events. The arena will also feature 24 VIP boxes and four sky bars / lounges. Seats in the arena are designed to provide good visibility and create a wave effect. Shared locker rooms and services for athletes using the courts will be located on the same floor. "The structure has been designed to reduce energy and water consumption, as well as enhance efficiency." The arena will offer a separate 200m² area with workspaces for media personnel. Vehicles will be directed through three tunnels to manage traffic during matches and events. The design also includes an auxiliary court capable of hosting 2,000 spectators and an ice rink. The structure has been designed to reduce energy and water consumption, as well as enhance efficiency. It will include sustainable features, such as rainwater harvesting, grey water treatment and solar panels. It will also use local plants and low-emission materials, and operate paperless ticketing. The structure aims to fulfil 35% of its energy needs through renewable sources, use 50% recycled construction materials, and harvest rainwater to meet 60% of its water requirements.